"Amidst the hysteria surrounding cyberbullying and sexting, Hinduja and Patchin represent a sane, sensible voice that helps us all better understand these phenomena and what is really happening here. This book is filled with useful information and practical tips for those who seek to create positive school climates where bullying of all kinds is minimized. Every educator should buy it and read it." "It is critical that educators, school administrators, parents, and technology companies work together to promote positive behavior – online and off. This practical guide provides important information, backed up by careful research, about the ways that adults can help build constructive dialogues and relationships with students." "Working with schools around the country, I know firsthand how much pressure there is to find an “answer” to bullying in schools, whether because of recent laws mandating programs and training or the community demanding answers. It’s hard to know what resource is best. It’s especially confusing because a bullying-prevention industry has bloomed to take advantage of this need but so many of these programs lack content based on a realistic analysis. I’m not at all surprised that Justin Patchin and Sameer Hinduja have created the resource all schools should use in School Climate 2.0, either to meet the new legal requirements or truly do the hard and comprehensive work of creating a culture of dignity in a school. From understanding the true dynamics of cyberbullying, to outlining a commonsense strategic plan for educators that will work with their individual community, School Climate 2.0 to my mind is really the most important resource currently available. I will more than strongly advise every school I work with to use this book. Say it this way: if I could make School Climate 2.0 mandatory reading for every school administrator in the country, I would." "Blaming technology is easy. Addressing the socio-cultural dynamics that shape young people’s lives is hard. Yet, to address hard problems like bullying and sexting, this is precisely what we need to do. In School Climate 2.0 Sameer Hinduja and Justin W. Patchin flesh out the relationship between technologically mediated issues and school climate before offering valuable strategies for educators and community members to address problems in their schools. Both grounded and practical, this is a must-read for all who are scratching their heads about how to prevent bullying and sexting." "By cutting through all the media hype and speculation, Hinduja and Patchin present an accurate and helpful analysis of issues related to young people’s use of technology. By pointing out that the vast majority of youth are using technology safely and responsibly, they’re able to focus on the real issues, the real problems, and the kids who need our help. By basing their advice on rigorous research, they are able to come up with strategies that are effective and appropriate. I’m especially pleased that the authors focus on social norms and school climate by sharing insights into how the overall climate of a school affects the behavior of everyone in it." "This is an immensely helpful and well-sourced book. It gives a thorough introduction to adolescents’ use of new technologies and sexting and cyberbullying. It makes a strong case that school climate is a vital factor in regulating these abuses. There are excellent chapters on how practical intervention strategies can be implemented in schools. It will be a great resource for teachers, educators, and parents." "A rarely seen compendium of school strategies that have worked, School Climate 2.0 moves past the headlines to offer a textured discussion of what we really need to strengthen school culture and improve teens’ and schools’ relationships to social media." "Sameer Hinduja and Justin Patchin remind us early on that, contrary to most media hype, most young people use their ubiquitous technologies safely and responsibly the majority of the time. Then, they discuss how a positive school climate is fundamental for all of learning and teaching. They share innovative, pragmatic strategies to enhance climate and thereby foster a better social environment—which will reduce behavioral problems offline and online among youth. This very readable, very user-friendly book should be considered mandatory for all preservice teacher education programs and be used as a guide for planning ongoing inservice training as schools prepare to better meet the needs of their 21st century students." "While Sameer Hinduja and Justin Patchin have a history of providing leadership in solid research and effective outreach on issues of youth risk in a digital age, in this book they have massively outdone their past excellence. Grounded in the understanding that the majority of young people make good choices online and effectively handle the negative situations that do occur, but that a minority of young people are at higher risk, Hinduja and Patchin craft recommendations for a positive school climate approach to help all young people learn to make good choices and assist their peers." "Finally, a book that takes a holistic approach to the cyberbullying problem! There is no dividing line between school and home when it comes to the ways members of this generation relate to one another. A positive school climate can only help create a more positive home environment, and vice versa. This book gives readers specific guidance regarding how to prevent cyberbullying, sexting, and other problematic online behaviors." 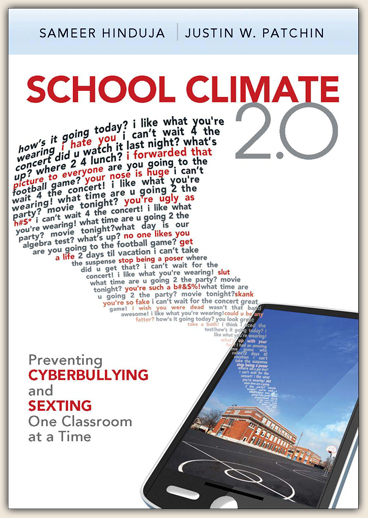 "School Climate 2.0 is a wise and practically helpful book. The authors are national leaders in cyberbullying. They present a helpful overview to the problem and most importantly a series of concrete suggestions about how we can make our schools safer, more supportive and engaging. In addition, the book is filled with “voices from the field”, prevention points, discussion questions at the end of the chapter which all serve to make this volume practically helpful to educators. I highly recommend it!"